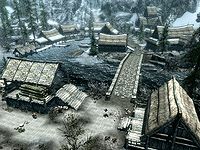 Hjaalmarch is well-known for the salt marshes which dominate the north and central areas of the hold, stretching from Fort Snowhawk in the west to Ustengrav in the east, formed by the River Hjaal breaking into many tiny streams. 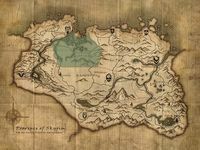 Much of the rest of the hold more resembles neighboring holds, for example, in the south and east of the hold, the terrain is more resemblant of the Pale along the border with that hold - snowy pine forest and plains broken up by crags around the Stormcloak camp and Ustengrav. 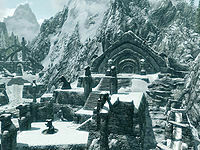 The southern half is mountainous terrain above the snow line, although in the west, the mountains give way to the Hjaal river valley, where the climate is more resemblant of neighboring Whiterun Hold. 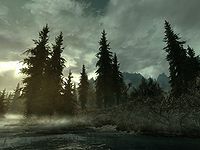 Beyond Fort Snowhawk, in the hold's western extremities lie pine forests and meadows, much like those found just across the Karth River in Haafingar. 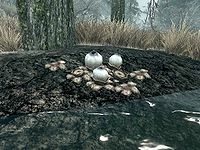 This page was last modified on 21 April 2019, at 01:07.